Pluto's receding crescent as seen by New Horizons at a distance of 120,000 miles (200,000 kilometers). In July 2015, we saw Pluto up close for the first time and—after three years of intense study—the surprises keep coming. These are combined observations of Pluto over the course of several decades. The first frame is a digital zoom-in on Pluto as it appeared upon its discovery by Clyde Tombaugh in 1930. More frames show of Pluto as seen by the Hubble Space Telescope. The final sequence zooms in to a close-up frame of Pluto taken by the New Horizons spacecraft on July 14, 2015. Pluto’s surface sports a remarkable range of subtle colors are enhanced in this view to a rainbow of pale blues, yellows, oranges, and deep reds. Many landforms have their own distinct colors, telling a complex geological and climatological story that scientists have only just begun to decode. The image resolves details and colors on scales as small as 0.8 miles (1.3 kilometers). 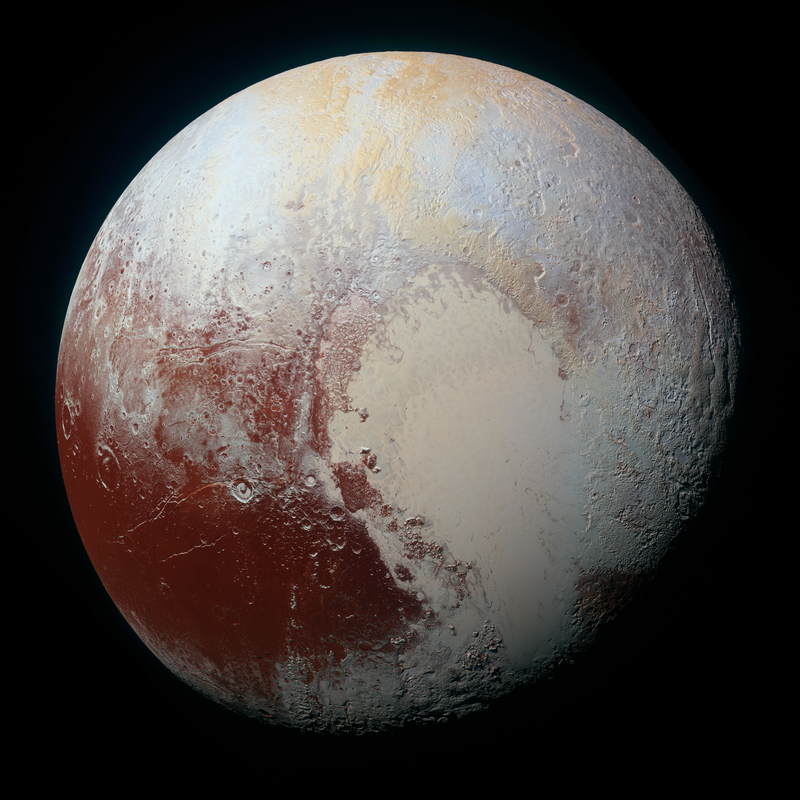 Zoom in on the full resolution image on a larger screen to fully appreciate the complexity of Pluto’s surface features. July 14, 2015: New Horizons team members Cristina Dalle Ore, Alissa Earle and Rick Binzel react to seeing the spacecraft's last and sharpest image of Pluto before closest approach. Just 15 minutes after its closest approach to Pluto, the New Horizons spacecraft captured this near-sunset view of the rugged, icy mountains and flat ice plains extending to Pluto's horizon. The backlighting highlights more than a dozen layers of haze in Pluto's tenuous atmosphere. The image was taken from a distance of 11,000 miles (18,000 kilometers) to Pluto; the scene is 780 miles (1,250 kilometers) wide. Found near the mountains that encircle Pluto’s Sputnik Planitia plain, newly discovered ridges appear to have formed out of particles of methane ice as small as grains of sand, arranged into dunes by wind from the nearby mountains. The vast nitrogen ice plains of Pluto’s Sputnik Planitia – the western half of Pluto’s “heart”—continue to give up secrets. Scientists processed images of Sputnik Planitia to bring out intricate, never-before-seen patterns in the surface textures of these glacial plains. High resolution images of Pluto’s largest moon, Charon, show a surprisingly complex and violent history. Scientists expected Charon to be a monotonous, crater-battered world; instead, they found a landscape covered with mountains, canyons, landslides, surface-color variations and more. One of two potential cryovolcanoes spotted on the surface of Pluto by the New Horizons spacecraft. This feature, known as Wright Mons, was informally named by the New Horizons team in honor of the Wright brothers. At about 90 miles (150 kilometers) across and 2.5 miles (4 kilometers) high, this feature is enormous. If it is in fact an ice volcano, as suspected, it would be the largest such feature discovered in the outer solar system. Pluto's receding crescent as seen by New Horizons at a distance of 120,000 miles (200,000 kilometers). Scientists believe the spectacular blue haze is a photochemical smog resulting from the action of sunlight on methane and other molecules in Pluto's atmosphere. These hydrocarbons accumulate into small haze particles, which scatter blue sunlight—the same process that can make haze appear bluish on Earth. On Jan. 1, 2019, New Horizons will fly past a small Kuiper Belt Object named MU69 (nicknamed Ultima Thule)—a billion miles (1.5 billion kilometers) beyond Pluto and more than four billion miles (6.5 billion kilometers) from Earth. It will be the most distant encounter of an object in history—so far—and the second time New Horizons has revealed never-before-seen landscapes.